WARNING: For important information about navigating safely and avoiding distraction while driving, see Important safety information. 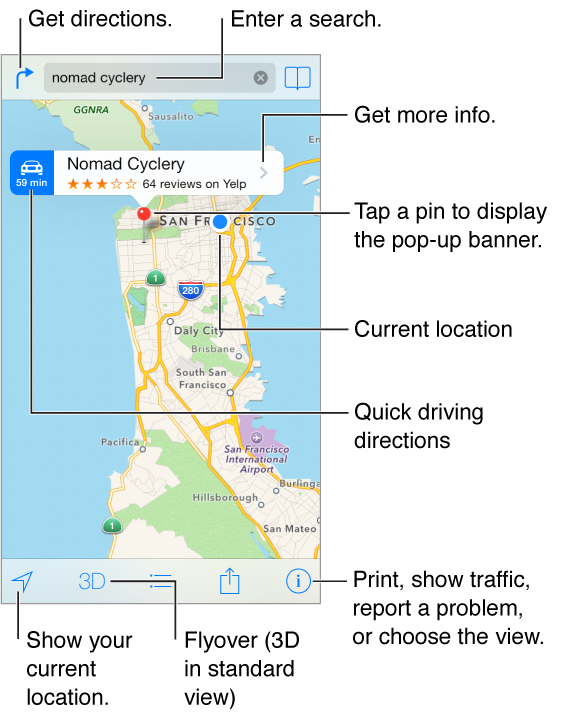 Important: Maps, directions, Flyover, and location-based apps depend on data services. These data services are subject to change and may not be available in all areas, resulting in maps, directions, Flyover, or location-based information that may be unavailable, inaccurate, or incomplete. Some Maps features require Location Services. See Privacy. Move around Maps by dragging the screen. To face a different direction, rotate with two fingers. To return to north, tap the compass in the upper-right. Zoom in or out. Double-tap with one finger to zoom in and tap with two fingers to zoom out—or just pinch and stretch. The scale appears in the upper-left while zooming. To change how distance is shown (miles or kilometers), go to Settings > Maps. Or if Maps guesses where you’re headed while you’re entering a search, tap that location in the list below the search field. Find the location of a contact, or of a bookmarked or recent search. Tap . Choose your view. Tap , then choose Standard, Hybrid, or Satellite. Manually mark a location. Touch and hold the map until the dropped pin appears.